TRAVEL TALES (Available only as e-books) is a series of short travel stories, journeys spiced with humor and interesting international characters, in famous or little known places. TRAVEL TALES will keep the reader laughing, entertained and inspired. An American woman finds herself in an adventure in a foreign land, while discovering different cultures, local folklore, food, music, and sometimes danger. This Travel Tale takes place in Mexico. This Travel Tale takes place in Greece. 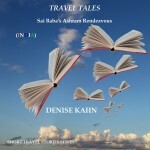 This Travel Tale takes place in India. This Travel Tale takes place in Switzerland.